We were passing the little lane to get to Carter Road when we stumbled upon a tiny colourful eatery which was screaming out to us. LSD - Love, Sugar, Dough is a brand new dessert shop and bakery that sells irresistible desserts and scrumptious baked goods. Extremely colourful and vibrant, these adjectives describe the interiors of the place and also the display of cupcakes which interestingly has small and large cupcakes with different shades of frosting. Run by Sheeba Hasan - a major in marketing and Tarannum Aziz - a baker since twelve years, this place looks like it has been designed with a lot of love. Their menu comprises of croissants, sandwiches, breads, toasties, biryanis, beverages, pastries, cheesecakes and cupcakes. Okay, stop drooling! They also customise cupcakes and are soon going to start with cakes. 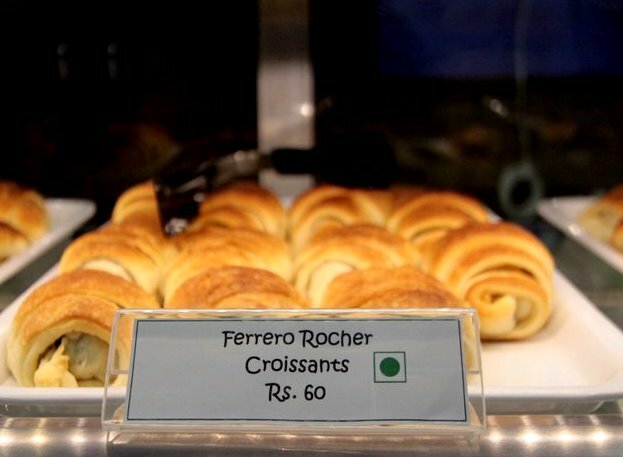 The highlights of their menu are the 'Ferrero Rocher Croissant' and the 'Sip - a - brownie' shake! Their cupcakes are also quite delicious and they are definitely giving some tough competition to their very popular neighbour. Click here for entire menu. looks yummy will give it a try ..